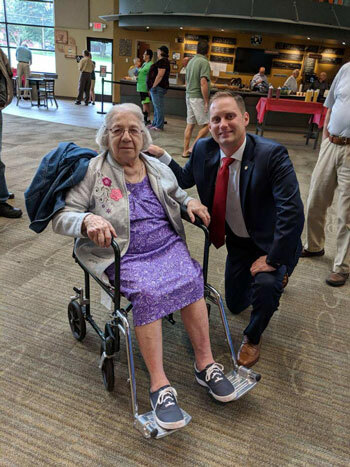 Thank you to everyone who came out on Friday to my second annual Senior Expo at Bethany Wesleyan Church in Cherryville. It was great to see everyone gain valuable information from the more than 80 different organizations present. Each month one of my district offices hosts monthly veterans’ outreach hours. Openings are still available for the Thursday, Oct. 4, session in my Northampton District Office, 2030 Center St. Appointments also are still available for the Thursday, Nov. 1, session in my Slatington District Office, 125 S. Walnut St. The spotted lanternfly (SLF), a pest native to China and Vietnam, was first discovered in Berks County in 2014 and presents a significant threat to Pennsylvania’s agriculture industry. Products specifically at risk include grapes, tree-fruit, hardwoods and nursery items. The pest has since spread to 13 counties – Berks, Bucks, Carbon, Chester, Delaware, Lancaster, Lebanon, Lehigh, Monroe, Montgomery, Northampton, Philadelphia and Schuylkill – which are now considered to be part of a quarantine area. While little is known about the insect's behavior and biology, researchers at the Penn State College of Agricultural Sciences and United States Department of Agriculture (USDA) are working to gather scientific data on how to contain and manage this pest. The Pennsylvania Department of Agriculture (PDA) and USDA are working to implement containment and control efforts. To access the website, visit my website at RepMako.com or click here.